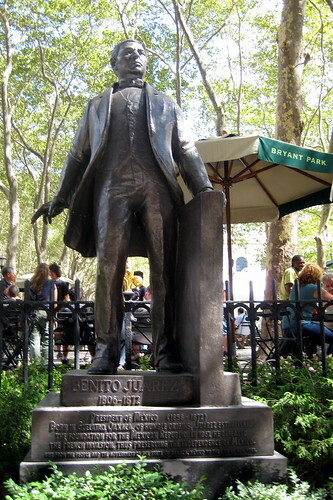 This sculpture of Benito Juárez, the Mexican independence leader and president, by Mexican artist Moises Cabrera Orozco was erected along Avenue of the Americas between 41st and 42nd Streets along the perimeter of Bryant Park on October 9th, 2004. 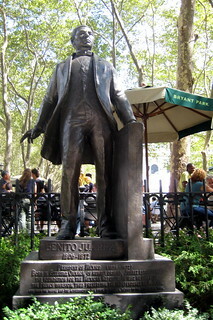 Benito Pablo Juárez García (1806-1872), known as "Benemérito de las Americas." was known as the builder of modern Mexico. A Zapotec Amerindian orphaned at age three, he rose to governor of Oaxaca at age 41. Juárez served five terms as president of Mexico: 1858–1861 as interim, 1861–1865, 1865–1867, 1867–1871 and 1871–1872. Benito Juárez was the first Mexican leader who did not have a military background, and also the first full-blooded indigenous national to serve as President of Mexico and to lead a country in the Western Hemisphere in over 300 years. For resisting the French occupation, overthrowing the Empire, and restoring the Republic, as well as for his efforts to modernize the country, Juárez is often regarded as Mexico's greatest and most beloved leader.